Most of the time this blog focuses on individual aspects of 2.0 thinking or applications. But every once in a while, it's nice to go back to the big picture. James Yasko is writing an article for an upcoming issue of Museum News on museums and Web 2.0. He got in touch with me last week to discuss some ideas for the article and asked me to respond to a few questions. One of these was a general question that I thought might be of interest to you. What advice do you have, as one who keeps up with technology as it relates to museums, to a group looking to incorporate Web 2.0 into their repertoire? 1. Set your high-concept goals and find a Web 2.0 technique/application that will fit those goals. Are you trying to establish yourself as an up-to-the-minute news source on topics related to your museum’s content? Blog. Do you want to offer audio or video programming to an international audience for free? Pod or Vodcast. Do you want to become a community nexus? Start working the social network sites. Do you want visitors to contribute to the classification and presentation of your artifacts? Start thinking about tagging and folksonomies. It’s not acceptable to say “we want to do it all.” If you had one youth educator, would you expect them to develop and run overnights AND scout programs AND teen programs AND toddler programs AND outreach AND… of course not. You would set a strategy that best serves the mission of the institution. 2. Start conservative and build from there. There’s a term in podcasting, “podfading,” that describes podcasts that are launched with vigor but fade into non-existence as its producers become overwhelmed or lose interest. Blogfading is rampant as well; casual clicking on museumblogs.org reveals more than a few blogs that have dropped off the face of the internet (and according to Technorati, there are over 1 million blogs that exist only long enough to sustain a single post). While this trend might be acceptable (though annoying) when the blogs are personal, it's unprofessional--and unacceptable--when the blogs are institutional. Museums need to develop sustainable models for projects that require frequent content updates. How can you avoid getting burned in this way? Some museums start with internal projects (blogs, wikis, tagging experiments) that are then released to the public once the kinks have been worked out and the quality level is adequate. Others set the bar low by being clear from the start about the frequency of content. At the Spy Museum, for example, we launched podcasting in the fall and committed to monthly half-hour episodes. The production value is high, the content is enjoyed by thousands of listeners, and the work required to produce each episode is manageable. You can always be a hero by increasing the frequency of your content later; it doesn’t work so smoothly the other way around. 3. Get all the departments on-board. Executive, marketing, content, and IT/web folks all have a stake in these projects. While the driving force (and the bulk of the work) may fall on one team, everyone’s concerns and needs have to be addressed. Who will be impacted resource-wise? How will the endeavor reflect on the museum’s brand image? Web 2.0 projects can also be a great way to connect staff across the institution and empower people in non-creative positions to contribute content. At my museum, our COO often talks about how different museum projects fill three “buckets”—staff, visitors, and financials. While there’s a lot of focus in most museums on financial and visitor success, I think there’s room for improvement in terms of educating and supporting staff. You don’t have to be a curator or a marketing person to be involved in your museum’s blog or social network. And the more people get involved, the more diverse voices are reflected and the more staff feel connected to and empowered by the institution. 4. Keep statistics. Once you are rolling with a project, set metrics for success and keep everyone apprised of the impact the project is having on the institution in general. 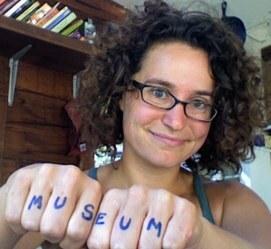 Has your tagging system increased overall google hits for the museum? Do your MySpace friends come to museum programs? 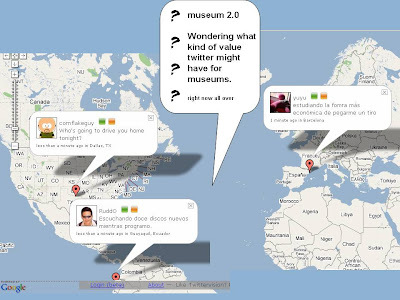 Keep the overall museum mission in mind and report on the ways your Web 2.0 activities support that mission. 5. Be flexible and open to irreverence. Web 2.0 encourages non-authorities to participate in content creation and interpretation. For museums, this means we cannot continue to be stingy with the stories in our galleries, to hold interpretation of objects and history in a clenched fist. A good way to test your personal comfort with this openness is to start by encouraging irreverence in yourselves. How does your institution react to forum-style programming, risqué marketing tactics, or opening exhibits in prototype? How tightly held is messaging about the museum and its content? 6. Don’t wuss out. Many museums are using Web 2.0 in a very cursory way as another distribution pipeline for the same messages and content presented throughout the institution. While you may get some buzz just for using the technology platforms, the real power comes when you use Web 2.0 to offer programs and opportunities that are new to the museum. This can mean presenting new content rapidly, without going through the long exhibit or program development and implementation cycles. It can mean supporting staff and visitor opinions about the museum. It can mean encouraging social participation with other museum supporters. It can mean using visitor content and comments to adapt and grow the core museum content. We’ve known for a long time that visitors define their own museum experiences. There’s a lot of fear around that reality. Web 2.0 sites take the radical stance that it is DESIRABLE to have users define not just their own experience but everyone’s experience. Can you grin and bear it? What am I missing here? What advice would you give? What kind of advice are you looking for? One user contribution should spark the interest of one thousand lurkers, rather than requiring one thousand contributions from other users. In the spirit of this sentiment, this week we look at games for lurkers, that is, games people watch. Games people watch? Isn’t the point to play games? Why would I want to watch you pass Go? I’d guess, in this country at least, more people watch games than play them. The majority of people who participate in football, golf and poker do it through their TVs, not on the field/table/course. The audience for games is gigantic, and sports fans are some of the most obsessed, energized, and involved lurkers on the planet. In museums, we always assume that everyone wants to get their hands dirty and “do it.” But are there ways to create games in museums that are as exciting to watch as they are to play? 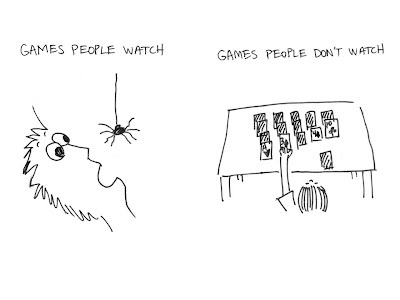 What distinguishes games people watch from those they play? People watch games that have high stakes. Whether it’s soccer or Survivor, games on TV are more intense than games at home. What makes them more intense? It can be the expertise of the players (sports), the shame of failure (reality games), or the extremity of success (game shows). I was in a bar recently and found myself captivated by “Deal or No Deal,” a show that features the simplest game in the world: a contestant opens suitcases with dollar amounts (up to $1M) behind them. She decides whether to stop or continue. That’s it! That’s the whole game! But the combination of the pressure on the contestant, the personality of the host, and the dollars involved make it an enthralling half hour. In museums, we’re not going to hand out thousands of dollars or vote people off the island. And the higher the stakes, the fewer qualified contestants exist (qualified either in expertise or fearlessness). But most game-like interactives in museums have NO stakes. I think there could be ways to humorously (and publicly) share the outcome of these activities with others. Even just putting the players in a position where an audience is possible ups the stakes of the game and makes for a more exciting experience for all involved. People watch games when they can emotionally connect to the players. At first, I thought that people mostly want to watch experts play games. Watching professional sports games is primarily about enjoying the participants’ level of mastery, watching experts play the game “as it should be played.” No one turns out to watch little league for love of the game; they do it for love of their (non-expert) kids. But you don’t need experts to put on a great show. People still obsess about those little league games. And game shows and reality TV are all about the enjoyment found in watching non-experts compete. Even when the contestants are experts in another way, they are made fools of on Dancing with the Stars, Not My Job, etc. The key isn’t the expertise of the players; it’s the potential for us to feel emotionally connected to them. That’s why people root for the home team, obsess over player’s personalities, and swell with pride over our kids’ on-base hits. How can museums tap into this cult of personality and emotional connection? We can start with pre-existing connections among visitors, developing interactives and games in which cheering and support for the player are encouraged. And in situations where the visitors are watching others “play”—whether in debate, museum theater, or otherwise—we can play up the character of the players. Most museum “players” are presented in a pretty objective light. I wouldn’t mind seeing a little more WWE-style energy and playfulness in the characterization of Sam the Energy Saving Squirrel and his compatriots. People watch games that are made to be watched. This may sound obvious, but there are specific tricks that make games “watchable.” Poker is a great example. It’s usually an intimate game, and on the casino floor it would be extremely bizarre—not to mention dangerous to one’s personal health—to stalk around the players, scrutinizing their cards and facial expressions. But televised poker lets you do just that, and get inside a highly psychological game. One of the best museum applications of this concept is quite a simple one. In the Connections exhibit at the New York Hall of Science, there’s an arm wrestling interactive in which you can arm wrestle with someone at another museum via a network and robotic sensing arms. You grab the robo-arm, and at the count of three, you face off against the remote person and their own robo-arm. There’s video of the other person so you can watch them struggle as they watch you struggle. I had a fabulous time watching kids use this interactive. The Hall has two of these kiosks, so for the most part, kids were getting linked up to play against someone just ten feet from them. But watching them struggle and watch each other—both via video and by turning around, was hilarious and exciting. They were putting their all into it, and we were all having fun. People watch games that acknowledge the lurkers’ presence and importance. Ask a fan at a soccer game if their cheering “matters” to the game. They may shrug sheepishly, but deep down, we feel like contributors—even if all we are doing is watching someone else play. Professional athletes acknowledge their fans. Game show hosts turn to the audience. I think it’s fascinating that so many reality games are now going beyond acknowledgement to incorporate at-home audiences in voting for players and determining the course of the game itself. The line between player and lurker gets hazy, and everyone gets more into the experience. This showcasing of the activity also encourages greater participation. If you approach an apparatus no one is using, you might be uncertain as to how fun or interesting or challenging it will be. But if you get to watch people use it beforehand, you may overcome personal barriers of comfort or readiness and jump in, too. This is what makes social games like charades and truth or dare enjoyable. You watch, you laugh, and then you step up to the plate too. People watch games that are beautiful and awe-inspiring. This can be pro scrabble players putting down their bingos, wheelchair basketball, or computers playing chess. Games are about conflict and goal-seeking. Both of these are classic themes that we are drawn to in story and reflect our basic human questions and desires. When we can take real issues in the world and couch them gracefully in the guise of a game, they become understandable, emotional, and deeply compelling. They become something worth watching. Posted by Nina Simon 67 comments, add yours! Last Friday, I had a discussion with Chris Catanese from the Museum of American Finance about things museum can learn from the technology (and web 2.0) world. We didn't dwell on twitter and high-speed gadgets; instead, we focused on lessons from the business side of the technology field. On the face of it, museums are a lot more like banks than they are like dot coms. The corporate mentality is low-risk, averse to endeavors that don’t obviously support the museum’s mission statement or bottom line. And while we’ve all heard the horror stories of the excess at dot coms circa 1998, when each employee was given their own alpha-wave measuring espresso-maker, there are also the successes—the Googles and Squid Labs and iRobots—that are pioneering not only new products, but new ways to do business as well. There’s a catch-22 about innovation: everyone wants wild and wonderful ideas, but no one wants to invest the time and space (and bad ideas) it takes for those gems to arise. In most businesses, including most museums, the corporate culture values “doing your job” to the exclusion of other endeavors that might create a huge hit for the business and the bottom line. But many technology companies don’t work that way. Google is the gold standard, encouraging each employee to spend 20% of their time (one day a week) on projects of their own devising. I’ve heard about another employer—a hotel—that offered $1000 to employees to use on self-determined projects to improve the guest experience. These initiatives are not instituted by companies to make their employees feel good (only). These companies recognize that innovation requires time and resources and that the potential reward of offering those resources is worth the risk. Three years ago, at ASTC, I took part in the RIG (rapid idea generation) session offered by Julie Bowen and others from the Ontario Science Centre. It was an energizing three-hour activity, one that their staff uses several times a month for cross-company brainstorming. At the end of the session, Julie asked us, “how many of you see this as viable in your institution?” We all desperately wanted it to be viable and yet knew that the cultural obstacles at most museums would be insurmountable. The immediate reaction to these kinds of initiatives is fear—that people won’t do their jobs, that they’ll be wasting company time—but it’s my guess that people who have this opportunity become more passionate about their jobs, more aware of the broader goals and interests of their company, and feel more valued and respected by their employer (and therefore more likely to stick around). Those are “soft” gains, but there are hard gains too—the one in a hundred idea that turns into a hit. Beta’s been getting more action than all the other greek letters put together these days. When I started using flickr, librarything, and grand central they were all in beta. Heck, two of them still are in beta. This isn’t a testament to my 2.0-savviness; it’s indicative of those businesses’ mentality towards finished products. When it comes to products that are user-centric (as museum products should be! ), the companies that develop the products realize that they need users—not just testers, but bona fide users—to finish the job and help them determine what the final functionality of the product will be. In museums, we often talk about the fact that “visitors make their own experiences,” and yet it’s a fact we swallow begrudgingly, like pills that are too big. Instead of fighting their users for control, web 2.0 businesses court users and cross their fingers that the users WILL create their own experiences. It’s much easier to succeed by providing features that people are clamoring for than by guessing what they might appreciate. There are some museums so large that they resemble military encampments, each department a fortress with its own culture and governance. I often meet people from big museums who talk about staff from other departments as if they were rare birds sighted once a decade. This is a frequent but accepted by-product of large institutions of all kinds. You start out as a small group working together in one room, development sitting next to exhibits sitting next to security. But eventually everyone has their offices and staff and walls—literal and figurative—start to harden. Is there another way? Some media and technology companies are experimenting with new ways to put teams together for projects, trying to integrate people with different talents and experience more flexibly. Sure, there’s a logistical challenge: who’s your boss if you float from project to project with different managers? Where do you sit? Introducing ambiguity in the answers to some of these questions may be a good thing if it reduces factionalism. There was an exhibit at MOMA on the new CCTV building in Beijing that included a demonstration of the projected daily paths of different kinds of employees through the building. The design intentionally supports overlap and mixing, even though that means lots of walking (and presumably, incidental interactions with others). The points above are all about actions that tangentially relate to company or museum brand. One of the most striking things about technology companies—and this has now had impact across American business—is the extent to which company culture often IS the brand. Google’s motto isn’t “bringing search to you.” It’s “don’t be evil.” It’s hard for me to separate IDEO from their (literally branded) creative process, or Make magazine from its DIY ethic. The first piece of this is having and supporting a strong, energized, positive company culture. But the second part is encouraging staff—and visitors—to evangelize. There are some technology companies that have a full-time employee, high up in the corporate team, with a strange title: EVANGELIST. I remember the first time I met someone who said he was an evangelist. I told him I was Jewish. I’m not sure how useful such a person would be for museums, which are more about long-term sustainability than fueling the hype fire, but encouraging staff to blog, to speak at conferences, to grow and spread the museum word, is good for buzz and long-term image. The great thing about all of these points is that the companies that are most aggressively pursuing them are successful for-profit businesses. The for-profit world is famous for being more bottom-line oriented and less staff development focused than the non-profit world. But now, there are for-profits that are outclassing museums with respect to innovation, and making money at the same time. Why WOULDN’T museums want to get on the trampoline and see what happens? Share Your Thoughts: Do you remember the first time you read the Diary of Anne Frank? Please share your memories of reading that book, and its impact on you. Did the information in this Web site surprise you or change your view of Anne? In a six month period ending last month, 655 comments were submitted to this board. (For comparison, the most commented-upon museum blog, Botany Photo of the Day (according to Jim Spadaccini and Seb Chan’s recent report) received 128 comments in a one month period.) The comments largely address Anne's courage and talent and the comments have a theme—heartfelt, inspired, and personal. But not all of the Anne Frank visitor comments make it onto the site. Of the 655 submitted over six months, only 151 were approved for display. When I asked about the content of the rejected comments, I was surprised to hear that it was neither spam nor hate speech that kept comments off the site; it was redundancy and lack of quality. Apparently, a lot of people submit one-line comments like, “I love Anne Frank,” and those comments don’t add a lot to the conversation. Or do they? Go onto a MySpace page and check out the postings in the “Friends Comments” section at bottom right. Many are redundant, short, and silly. But when you post a comment on MySpace, you know that your comment will appear (unless the maintainer of that page finds it offensive). You get an instant reward for participating—momentary stardom. You are motivated to write more comments because of your success at “joining the conversation” this time—even if your contribution was insignificant, it gets as much space as anyone else’s. This isn’t a web-only phenomenon. Go downstairs and flip through the comment book at your museum’s front desk. How many comments just say, “I love this museum!” or “Johnny So-and-So is a loser!”? It would be absurd to imagine a comment book that required you to submit your comment for approval before it showed up in the book. Why do we do this on the web? Because we can. And there are some potentially good reasons for it. The facilitator of the Anne Frank board isn’t doing anything inappropriate; he or she has made a personal decision to curate the comments, to sculpt a visitor-generated exhibition, rather than open a forum for occasionally inane and redundant commentary. But the fact that this curatorial decision isn’t immediately apparent to commenters is a problem. The visitor starts to wonder what’s going on: Why didn’t my comment get published? Did we have technical difficulties? Do they not like my comment? The lack of instant gratification translates, in the visitor’s eyes, to a lack of respect for his or her contribution, and the visitor is disincentivized from commenting again. What’s the point? What appeared at first to be an open opportunity to join a conversation turns out to be something else entirely. If the text at the top was clear and said, “Contribute to this online exhibition of peoples’ reactions to Anne Frank’s diary,” visitors might understand that there are criteria for inclusion that their comments may or may not meet. There have been many exhibitions that employ such methods, soliciting stories and artifacts from visitors under the clear understanding that some, but not all, will be incorporated into exhibition. Museums need to determine what role they want to play—that of MySpace and comment books, which tolerate inconsistent quality in exchange for maximal participation, or that of the Anne Frank board, which restricts participation in exchange for substantive content. And once decided, the museum needs to communicate whether visitors are contributing to an exhibition (which makes editing understandable) or participating in a conversation (which makes openness paramount). Or would you prefer a hybrid model? Again, head into the museum galleries. There are many exhibitions that feature “talk-back walls” on which visitors can voice their impressions of the exhibition or answer questions. At the moment that you are a contributor, you know your comment is going up on the board immediately. There’s no one moderating the discussion real-time and every comment is included. But there’s not necessarily an expectation that your comment will stay up on the board for all time. As a lurker, when you walk up and look at the comments, you expect that you are looking at comments which are either very recent OR have been chosen by the curators as notable in some way. Sometimes, these “notable comments” are explicitly featured in some portion of the exhibition. This way, visitors can have open discussion real-time AND curators can choose which of those discussions to highlight and which to weed out later. In each situation in which you solicit visitor content, ask yourself: What do you value more, giving everyone a voice or sculpting a high quality experience from their contributions? How can you make your choice clear to the visitors? And, whenever possible, how can you design for the AND instead of the OR? I try not to focus too heavily on web tools on this blog, but this application is too lovely to pass up. It's called VoiceThread, and it's a program that allows you to create an elegant slideshow of images with audio (and text, and scribbles) to go along. You can use it to create your own narrative experience, and you can also allow other users to comment on and add their own commentary to the images. If you drool over fancy Flash interfaces for online collections, quit mooning around the IT department and head over to VoiceThread. They are committed to making this technology accessible (and free!) to educators permanently... there may be some great opportunities for collaboration for museums, too. Have you been to South by Southwest? Me neither... not yet. But this yearly music/film/interactive conference/festival/creative happening has risen to the top of must-gos for techy, arty, gamey folks. This year, one of the keynotes at the Interactive festival was delivered by Will Wright, legendary game designer who created Sim City, the Sims, and now, the forthcoming Spore. There was an interesting New Yorker article last year about Wright and the growth of the "God game"--that is, games in which the player controls an army, a city, or, in the case of Spore, the evolution of life and cosmos. Stories tend to be unchanging, very linear, whereas games tend to be open ended. Game is vehicle for player to explore different paths and directions. Movies are primarily visual, games are primarily interactive, so whenever we take control away from player at all we are taking away the most important thing about games. Like going to a theater and showing a blank screen. The circuit in our brain that makes stories appealing to us is empathy. Whereas in games it’s more agency, the fact that I’m causing what’s going on on the screen. Movie: What’s going to happen next. Games: Can I accomplish this? When I read this speech, I wonder, where do museum experiences fit in? 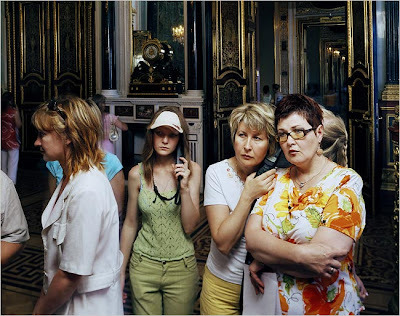 How often do museum visitors wonder what will happen next? How often do they wonder if they can accomplish a task at hand? Both of these impulses--to know where the story is going, to test yourself--are emotionally powerful. I worry that too often museum experiences offer neither of these, that visitors have no expectation of any kind of causality, and therefore, the kinds of emotional response people have to games and stories are not accessible in museums. I'm building a narrative immersion experience at the Spy Museum, and a lot of our discussions in creative development centered around how to balance player agency and story to elicit powerful emotional response. How linear? How open-enHow much should guests be forced to perform? How often should they get to sit back and take in the story? As Wright points out, the more agency you give the visitor, the less controlled, linear, and designed the experience will be. We want to take the player out of world of being Luke Skywalker and put them more into being George Lucas, make them the creator. Can we extract the entire world from their imagination? This statement shook me up. From the earliest phases of development for Operation Spy, we always assumed that people want to play spy--not spymaster. The God game archetype has a very different basic premise than most game/museum/experience design. Usually, we are trying to design a space around the user, creating a world, a story, a challenge, for them to step into. Wright's games put the designer's pen in the hand of the player. The success of games like Sim City suggests that there are people out there (lots and lots of them) who are not turned off or overwhelmed by infinite possibility--rather, they embrace it with the same emotional intensity others get from assuming one role in a larger context. Museums are contextual spaces; there's no way (nor much desire, I suspect) to allow players/users/visitors to design museums from scratch themselves. But if we want to involve visitors in design, the God games are an interesting model to consider. God games work because there is heavy design on the back-end to develop the tools that make story and world creation available to unskilled players. In Sim City, it was urban planning. 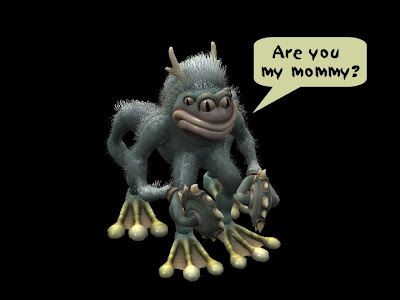 In Spore, it's 3D emergent creature evolution. When you are playing, it feels easy and automatic--and thus the tools empower you to take on what might otherwise feel like a daunting or impossible role. In that way, these games are analagous to many 2.0 applications that allow people to self-publish, self-aggregate, self-design. For me, the jury is still out on how much control the player should have over story; you lose a lot when the twists and tricks of designed causality go out the window. But the idea that designers can use their skills to create user tools instead of user experiences is exciting. What tools can we create to enable visitors to take more active roles in museum design, to try their hands as demi-gods of exhibitions, programs, and collections? Usually this blog is more about analysis than links. But this week, two articles about art, in the NYT and the Washington Post Magazine respectively, called out to be combined into a post about the role of visitors in art interpretation. Mr. Struth’s pictures are about this continuum, from artists like Velázquez into the public spaces where their works end up, and to us. What are we looking for in a museum? We go to find truth in pictures, and we end up reading one another’s faces. Is this a dramatic flair of the pen or a true statement? What do we look for in art museums? I spoke recently to an art museum person who said, “I think there’s an epiphany for everyone in the museum.” Epiphanies are not about objects. They are about our response to objects and experiences. Perhaps projects like Struth’s can help us identify, understand, and deepen those reactions. The second article is more provocative (and much longer). It is about a Washington Post experiment in which Grammy-winning, internationally acclaimed violinist Joshua Bell set up shop in the L’Enfant Plaza DC metro stop during morning rush hour, an empty violin case in front of him. His performance was arranged by The Washington Post as an experiment in context, perception and priorities -- as well as an unblinking assessment of public taste: In a banal setting at an inconvenient time, would beauty transcend? The Post set up a hidden camera to watch the action. But the camera was not as kind to Bell as Struth’s photos are to museum art pieces. Over 43 minutes, 1,097 people walked by. Of those, seven stopped for more than a minute to listen. Twenty-seven gave money (totaling $32.47). One person recognized him. After 43 minutes, Joshua Bell, who typically performs in grand concert halls for people who pay upwards of $100 a seat, packed up and unceremoniously left. The experimenters were surprised. They had expected potential mob scenes, not willful disregard. Mark Leithauser wasn’t surprised. Leithauser, a senior curator at the National Gallery of Art, commented that out of context, some of the Gallery’s greatest treasures wouldn’t garner a second glance. So what context does art need? An easy answer would be to say that art requires a designed, built home—whether a museum, a concert hall, or a theater—to be “properly” appreciated. But I think that’s limiting, both in terms of location and potential audiences. A better question might be: What kinds of environments support focus, appreciation, and epiphany? Commerce is powerful. What if Joshua Bell had placed some CDs for sale in front of him? If you have something to sell, you are valued by society in a different way. Contrast is distinctive. What if Bell had worn a tux? Would he have been disregarded as a kook or received attention as something unusual? In Providence, the Urban Curators hang fancy picture frames around industrial decay. The contrast between the gilt and the graffiti makes you stop and think about the enclosed image. Find captive audiences. What if Bell had played in a subway car? A subway station is a place you rush through. But buses, cars, and planes are places you are stuck. I love poetry in buses. I don’t have to look at it right away; I can look at it 20 minutes into my commute, look again ten minutes later. It’s not oppressive, and I can find my own time to appreciate it—or not. I don’t have to make a split decision of whether to slow down to look. Make it an event. What if Bell had hung a sign that said, “Violin performance from 8am-8:45 today only”? If you cannot design and sculpt the space in which art lies, you can do so with time. Create a limited place in time for an art experience and people may invite themselves in. Put it where people want it. People go to museums, concerts, and plays to see art of that medium. They expect it, and they hope to be rewarded with good content. But there’s a difference between expectation and desire. I desire art when I feel stressed, ungrounded, troubled—so I’d like to see more art in doctor’s offices, at work, when I’m waiting in line at the DMV. Where/when are the places that you want to receive art? Part of the issue here is about museums’ perceived ownership of art value. It’s considered denigrating to the art to place it in a context where cannot be appreciated “properly.” Was the Post’s experiment really a failure? It would be interesting to do this same test in a museum. If you wade through Struth’s photos, how often will you see someone having an intense, emotive reaction to art? Seven people out of a thousand? Maybe Bell wasn’t doing as badly as he thought. Due to the imminent completion/opening of Operation Spy, I will be at AAM for all of four hours... if I'm lucky. So I'm looking for someone who might want to report on 2.0-related elements of the conference. Your report can take the form of one long round-up post after it's over or a couple during the conference. Alternatively, I'd be happy to interview you about the conference (what impressed you, what projects did you hear about, what seemed great/lame). I'd want the post to be publishable by May 21. And what do you get out of it? Access to a few thousand informed, engaged users like you. An "in" to ask weird questions at the conference. Please contact me at ninaksimon (at) gmail (dot) com if you are interested. Last week, I went to an event at the National Museum of the American Indian to support the publication of Elaine Gurian's new book, Civilizing the Museum, which comprises 22 essays written over 35 years of experience developing and leading museums around the world. Elaine is considered one of the pioneers of the doctrine of inclusion in museums, pushing designers, curators, educators and museum directors to make their spaces open and meaningful to as many kinds of people as possible. In the introduction to her book, she says, "In some sense, all the essays in this volume seek answers to a single question: 'Why do railway stations have a broader spectrum of users than museums, and could museums, if they did everything right, welcome the same demographic mix through their doors?'" Museum are civil spaces where strangers can safely go and see each other. Users have access to real experiences via tangible evidence. What does this mean? Initially, I wasn't impressed by the first one--after all, strangers are everywhere. What's so special, or important, about just seeing strangers if you don't engage with them? Elaine pointed out that there are many places in this world where space is so segregated and inter-factional relations so strained that few such "safe congregant spaces" exist. She told a story about planning a museum project in Jerusalem three years ago. Elaine sat down with members of the Arab, Jewish, and secular community and asked: is there anywhere in this city that everyone can go? They thought and replied, the zoo. At the zoo, you can stick with your own family, but you still see other people. They have picnic tables, so you don't have to eat food prepared by someone else (who might want to do you harm). Being in the presence of strangers can be itself a kind of reconciliation. Why go to the zoo with strangers at all? Because unlike shopping or eating or educating kids, which many societies successfully self-segregate, the zoo features tangible evidence that isn't available elsewhere. So do museums. But this isn't enough, Elaine says, for us to pat ourselves on the back. After all, train stations bring in all kinds of people. The supermarket and the park are both full of tangible evidence that is interesting and somewhat unique to those locations. The way that we build on our tangible evidence and our inherent safety/civility is what defines the value of museums. In the Q+A, Elaine touched on some of these ways that we can design to keep museums essential. She has whole-heartedly embraced web 2.0 and talked about the fact that this is “the wild west of the web—the golden years before the fence posts go up.” She talked about museums becoming “service organizations” that anoint visitor voices from all backgrounds. And while Elaine continues to believe in the value of tangible evidence, she said, “in the keeping of things, museums think they have the information about what to say about them.” She advocated for a wider scope of object interpretation, including more multi-sensory, narrative, and emotional parts of the design palette. The more I listened, the more I wondered: What’s the difference between inclusion and 2.0? Is there a difference between a visitor who is included and a visitor who becomes a user? One of the important aspects of inclusion is that it considers different kinds of users—both current and potential—and their needs, entry points, and abilities. 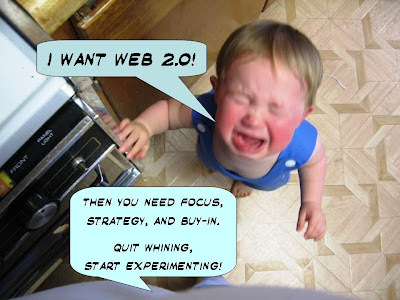 Web 2.0 doesn’t necessarily do that, for a couple reasons. First, the assumptions that web 2.0 applications make about their users—somewhat tech-savvy, happy to give up privacy for access—are often non-negotiable. While web 2.0 designers want maximal participation, they aren’t writing grants and coming up with different programs tailored to open their content to underserved users. The expectation is that the users are the ones who will tailor, and that the software is maximally flexible. Second, and perhaps more importantly in contrast to museums, web 2.0 applications don’t exist in a physical, designed space. How you feel in a museum or bank or train station is largely dictated by how the space is designed. Does the architecture welcome you? Is it imposing, confusing, inviting? On the web, inclusion depends much more on the content (are people respectful to each other on this bulletin board?) than the over-arching design. At her talk, someone asked Elaine, “who is the ‘we’?” to which Elaine replied, “the we is all of us.” It’s a great sentiment, and one that I believe requires both the lessons of inclusion and those of 2.0 (and probably a few others as well). 2.0 is about the FUNCTIONS we offer users. Inclusion is about the USERS who feel enabled to function. From the inclusion skeptic, there’s the question: Which wes are we excluding when we design particular functions? And from the 2.0 skeptic: Which functions are limited when we try to design for the universal we? The first chapter of Elaine’s book is called The Importance of “And.” She talks about the idea that there is no “right” answer—that the existence of multiple, potentially opposing answers informs and enriches museum experiences. Inclusion and 2.0 are not identical, nor are they opposing. What do you see in the “and” between the two? Looking through evaluations from many of these workshops, I was surprised to find that “smoking potentiometer” incidents educed better ratings of the workshop, not worse. Why might this be? First of all, your circuit setting on fire is funny, exciting, and something to be proud of. When your circuit doesn’t work for no discernable reason, it becomes an “I don’t get it” that feel disheartening. But if your circuit catches on fire, you DO get it, and you can show off to all your friends what happened. Kids whose circuits caught on fire didn’t feel like losers. They felt like players, engaged and ready to try again. In fact, I’d argue that by saying “If something starts to smoke…” in the beginning of each workshop, I introduced an element of suspense to what otherwise might feel like a pretty “safe” activity—a museum program. I planted in their brains the possibility that this might not be easy, might not be hygienic, that they might lose. At last year’s GDC, Jane McGonigal and co. presented the “top ten findings” from game research in 2005. Number 1 was about the importance of failure in games. According to Niklas Rajav from MIND Labs, players get more pleasure and excitement out of “active failure” than success. They found that attaining a goal decreases player arousal and interest. However, failure isn’t always fun. When the failure experience is “passive,” players disengage. What is active failure? Think of simple egg or water balloon toss games. 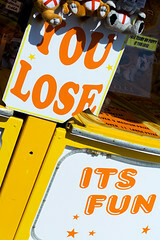 Failure in these games is physical, humorous, and public. There are some games out there with failure modes so “fun” that people try to attain them again and again. Dropping the lemmings off the cliff. Getting slimed. Watching your circuit go up in smoke. And there are other games that people love to participate in voyeuristically for the failure, not the win. Do people who watch American Idol or Survivor tune in to see who wins? Maybe at the end… but throughout the season, the excitement is in who gets axed. Frank Oppenheimer famously said, “No one ever fails a museum.” In the context of test-taking, this is a great sentiment that promotes inclusion and exploration over judgment and right answers. But in the context of gaming, it may be a disappointment. Designers strive to encourage “successful” visitor experiences. But by not acknowledging and designing the non-success experience, visitors often either feel a lack of challenge (because the goal attainment feels trivial) or they disengage (because the failure experience is passive). Designing good failure modes that are funny, instructive, fair, and supportive, can increase visitor interest and engagement with interactives. There are many interactives, especially in science museums, which only give feedback when you are successful. But if we start to think of these visitor interactions as game interactions, we can talk about introducing suspense and potential for failure—which can make the experience, ultimately, more successful. So next time I can’t get the power grid correctly distributed, let me watch the city fry. I’ll laugh, I’ll get it, and I’ll try again. Radical trust means trusting users not to muck things up (and rewarding them with control in return). ... It should also be stressed that most ’systems’ of trust in Web 2.0 applications are specifically constructed to encourage and protect, through safeguards and small but not insignificant ‘barriers to participation’ (Wikipedia’s login and lock controls, Slashdot’s reputation system, Google’s continual tweaking of PageRank etc) what is being described as ‘trust’. Do you trust your visitors enough to let them tag the exhibits in your museum or the online collections on your website? Do you trust them enough to publish these tags on a sign in the front of the museum or in a tagcloud on your homepage? Do you trust them enough to replace the text on your wayfinding maps with the user-generated museum tags? Do you trust them enough to let them edit each other’s tags? Would you make this process totally automated and unmonitored? Do you trust your visitors enough to let them rate the exhibits or artifacts in your museum? Do you trust them enough to publish the highest ratings as “top content” on wayfinding signage and publicity material? Do you trust them enough to reconsider or redesign poorly rated elements of the museum? 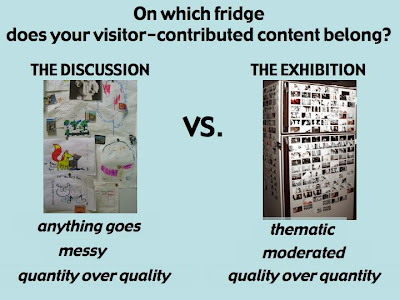 Do you trust your visitors enough to let them contribute to the content of your museum? Do you trust them enough to let them contribute to museum research? Do you trust them enough to judge, prioritize, and curate other visitors’ contributions respectfully? Would you allow content that you deem to be inaccurate? Would you allow content you deem to be offensive? Would you allow content you deem dumb, ugly, or non-useful? Do you trust your visitors enough to share with them the challenges of developing a new museum project? Do you trust them enough to blog about your process and solicit their comments? Do you trust them enough to act on their comments and engage in community design? How much money will/do you dedicate to these efforts?Give yourself a point for every $100k per year. Unlike those “are we soul mates?” quizzes, there’s no perfect score here. If you scored low, don’t worry. You’re in the same boat as 95% of museums. Of course, if you’re here because you haven’t thought about these issues before, it might be time to start. 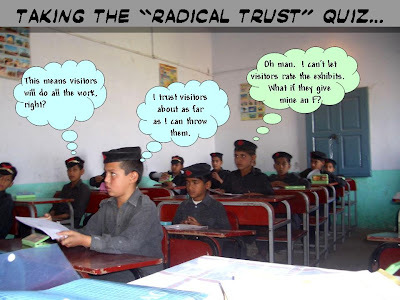 If you’re conceptually ready to accept some of the realities of what radical trust can entail, start experimenting, evangelizing, and implementing. And if you answered “yes” to every question, well, you’re a more courageous person than I. And the money question is huge. Evangelize, evangelize, evangelize. It doesn’t matter if you are ready to tear down the walls if the influencers are still skeptical of 2.0’s value. I scored a 13. How about you? What other questions would you add to this quiz? I caved to the peer pressure and registered www.museumtwo.com. Now, you can access this blog through this much shorter, hopefully easy-to-remember URL (or you can still go the old way if you prefer). Enjoy and spread the word! Be legible - use big, clear and bold lettering. Within five weeks, he had 100 postcards on display at Art-o-Matic. The cards were funny, heartwrenching, thoughtful, and beautiful. At the end of the show, he packed up and thought the secrets were over. But they had just begun. Now, two years later, Frank has received over 100,000 postcards. He publishes 20 each Sunday on a website that gets 1 million hits per week. He has published three books of cards (500,000 copies), has two more in the works, and has put on numerous gallery and museum shows of the postcards. Today at the AVAM, there were at least 300 people in the crowd to see (and handle!) the cards, get books signed, and share their passion for this project. Frank was a wonderful speaker. I was so impressed by his humility and his love and respect for the people who send him cards. But the truly awesome thing about PostSecret is what a great community project it is. As the AVAM staff member who introduced Frank said, “We can all be a part of PostSecret… it may even include the work of people in this room, which is part of what makes this so exciting.” And indeed, when solicited, about 20 people in the room raised their hands to say yes, they had sent in postcards. What makes this such a great community art project? PostSecret asks the right question. Museum designers labor over how to stimulate and evoke response from visitors. The most basic, and perhaps least interesting, question that is asked of visitors is, “What do you think?” How would you answer such a question? Frank’s question, or his entreaty—“send me your secret,” is both tantalizing and comforting. He publishes his home address for you to send your longings, fears, and desires to. People appreciate that openness and vulnerability, and take the opportunity to respond in kind. And the responses are beautiful, both in language and composition. As Frank put it, “their courage makes the art meaningful.” The contributors are writing about something deeply important to them. They care, and so they labor to create something of value. Random people may not be able to create great works of dispassionate art. But in this project, each artist is uniquely powerful because they give voice to something vital, something easy for viewers to access emotionally. PostSecret has a great medium. As Frank said, 4 by 6 inches is not enough space to explain an entire story. Because of that inherent insufficiency, contributors are compelled to use images, carefully select their words, and the result is something evocative that is open to interpretation. When you read a card that says, “I’m still in love with who you used to be,” where does your mind go? There’s a rich inner story behind each of the cards, and it’s within all of our grasp to imagine it. Also, the act of mailing something, of creating a physical thing and sending it off adds a tangible, potentially ritualistic element to “setting free” a secret. Frank told stories of postcards that came with $10 in postage, as if the author was concerned the card might somehow get returned to them. He also read emails from people who wrote cards, but then ended up giving them to others—family members, boyfriends, friends—instead of mailing them to him. PostSecret fosters an engaged, caring community out of anonymity. It’s extremely likely that individuals use the experience of writing a postcard to PostSecret as the stepping stone to sharing those secrets with loved ones. But perhaps more extraordinary is the extent to which PostSecret brings together strangers in support of one another. Each time Frank publishes a card that expresses insecurity or fear, dozens of caring emails come in. A boy sends a postcard with a photo of his blemished chest and asks, “who will ever love me?” The emails pour in: “I will. What’s inside counts.” In the Art-o-Matic show, one postcard read, “I’m a white guy who likes black girls.” During the show, Frank found that someone had written on this card. The stranger wrote, “That’s ok.” I heard so many stories of affirmation and caring today I felt like I was at a freaking Hallmark convention. But the stories were real, they represented interactions between stranger, and they were deeply affecting. 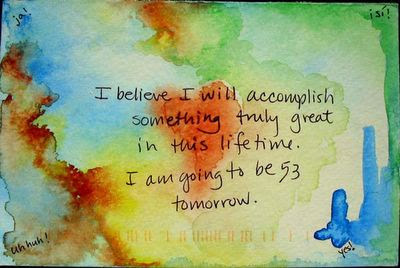 PostSecret motivates people to start their own communities and rituals for secret sharing. There are PostSecret spin-off sites. There are also people getting active in their own communities in suicide hotlines and traditional support lines. And then there are the unusual stories. One woman wrote her secret on a post-it and stuck it on the bathroom mirror in her large office complex. Later that day, she returned to find 12 other post-its with secrets surrounding hers. A girl whose postcard about anorexia was not published on the website made a shirt that said, “20% of anorexics die. Here are the symptoms of anorexia…” and wore it to school to spread her message. Classmates and teachers asked her to make t-shirts for them to wear, too. PostSecret has a ripple effect that not only engages people in that project; it engages them in the idea of sharing with others in all kinds of ways. PostSecret feels personal and immediate, as well as universal. Frank said that each time he gets a postcard in the mail, he feels like he is holding “a living secret being experienced in real-time." There’s an urgency to the secrets—even ones that have been hidden for tens of years—because the postcard represents the moment at which it was finally let out. Each week, the website offers new secrets, and the old ones, stored in Frank's basement, disappear. Frank commented that he thinks we love these cards not because we’re voyeurs, but because they reveal “the essence of humanity.” I’m not sure if that’s true, but there are certainly hundreds of postcards that resonate with me personally—and I imagine with everyone who views them. Across age, gender, continent, language, the PostSecret viewers see the same desires and troubles. There were many stories of personal action taken after reading others’ cards, and appreciation for no longer feeling alone in a secret or a feeling. Not every postcard makes the website; these days, Frank receives 1000 per week and publishes about 20. He says that he looks for cards that are authentic, that tell a story that feels powerful and hasn’t been shared before. Each week, he tries to create a narrative tableau of secrets to publish, looking for a hopeful one, a funny one, a confused one. By culling down the submissions for presentation, Frank is reinforcing the values that motivated PostSecret in the first place—people sharing honest, creative expressions of their secrets. It keeps the project focused. I felt mixed about this curated component originally. Enough people are looking at the website—why doesn’t he post them all and let people vote, like YouTube? Curating the cards probably helps keep exhibitionism and showboating at bay. It’s not about how many cards you create or how fabulist the tale you tell. It’s about how honest and real one person thinks they are. And the fact that the cards are only available for one week at a time--as an art piece, it evokes the immediacy of a secret, but as a new viewer I want access to all the content. And this is where museums (could) step in. In the ideal world, Frank’s basement—where he sorts and selects all the cards—becomes an open collection storage facility at a museum. Volunteers can come and help sort and scan the cards. Different people could curate—not just one person—and everyone would have access to the core data. The project is active, continuing, bringing new content to the museum each week and motivating people to return and get involved. PostSecret is self-help through art, through community. It opens people to each other and to themselves. It pulls in creative expression from all kinds of people all over the world. It has web components, but is essentially about physical objects. PostSecret is a model for where museums can go with 2.0. It doesn’t have to be postcards. It doesn’t have to be about secrets. What are the deep questions museums can ask to get people motivated to contribute, to listen, and to care?